If you thought Christmas in Branson couldn’t get any brighter, think again! 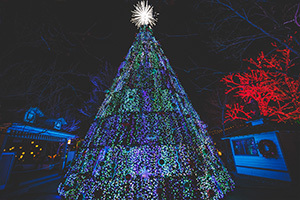 This year, Silver Dollar City's Old Time Christmas Festival includes more lights than, one of the top-acclaimed Christmas festivals in the U.S. by organizations such as The Travel Channel, Good Morning America, USA Today and CNN Travel. With 6.5 million Christmas lights seen through the theme park, Christmas in Midtown is the largest single lighting display in the last 20 years of Silver Dollar City’s Old Time Christmas. The festival features a 70,000 square-foot area filled with Christmas lights arranged in breathtaking scenes. Animated reindeer, stars, snowflakes, three light tunnels, two 40-foot moving trains and a 90-foot Christmas tree are just some of what you will see illuminated at Christmas in Midtown. The light displays will cover buildings and structures in the center of the theme park. Did we also mention the lighted canopy of angels flying overhead? You’ll be amazed any direction you look at Christmas in Midtown! Along with the Christmas in Midtown, An Old Time Christmas at Silver Dollar City is filled with traditional and magical Christmas activities. Returning to the theme park this year, Rudolph’s Holly Jolly Christmas Light Parade floats through the park twice every night during the festival. Kids can meet the famous reindeer and grand marshal himself at Rudolph’s Christmas Town, where reindeer games and cookie-decorating are musts. 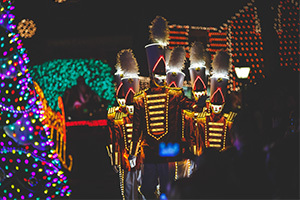 The festival offers plenty of Christmas entertainment, including two Broadway-style productions: “A Dickens’ Christmas Carol” and “It’s A Wonderful Life.” You can find 350,000 of the festival’s Christmas lights at the Christmas on Main Street light show in the park, where Silver Dollar City’s five-story, special-effects Christmas tree puts on a light show to remember every evening. Of course, Santa is waiting at Santa Claus Lane to check his list twice and meet his biggest fans on select dates of the festival. Holiday rides, shows, specialty Christmas shops and dining options are also open during An Old Time Christmas. Christmas in Midtown and An Old Time Christmas at Silver Dollar City is open Thursdays through Sundays, Nov. 3 through Dec. 30, select Wednesdays and after Christmas on Dec. 26 through Dec. 30. For more information, click here. This Christmas season, sip a cup of Silver Dollar City’s hot chocolate topped with the works while taking in the millions of twinkling lights and holiday scenery at Christmas in Midtown and An Old Time Christmas. We’re convinced nothing will make your holidays brighter!